ABI Aluflexmat senior mat from ABIMAT, it is manufactured by robust aluminium profiles, finished by different kinds of coverings like textile fibers, 6.6. nylon brushes or rubber, being an ideal product for high traffic areas. The total thickness is between 20 to 24 mm depending on the chosen top covering, the distance between profiles is 4 mm, the linking profile system is constructed with high resistant PVC pieces, the latex backing ensure no-movement and noise less. ABI Aluflexmat Senior is ideal for high traffic locations, ideal at civil engineering, hotels, hospitals, museums, universities, commercial centers, etc. 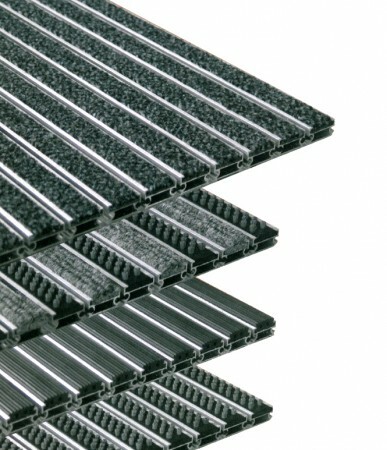 ABI Aluflex mat Junior is manufactured by robust aluminium profiles, from 10 to 14 mm height depending on the chosen finish. 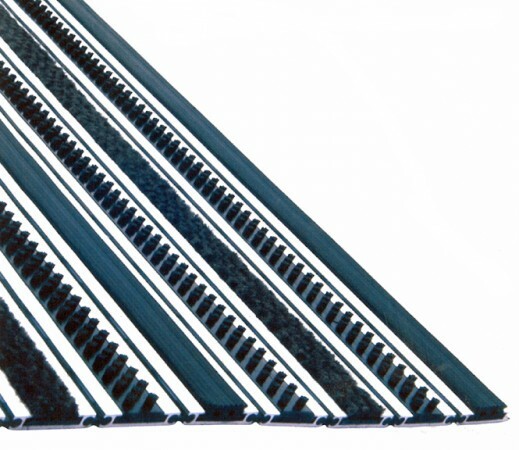 Aluminum profiles top finished by different kind of coverings like textile fibers, 6.6 nylon, brushes or rubber, being and ideal product for high traffic areas. The distance between profiles is 4 mm, the union of the profiles is made with very resistant PVC pieces, lt latex backing ensure no-movement and noise less. ABI Aluflex mat Junior is an ideal solution for heavy duty locations. Recommended location inside a mat well from 10 to 14 mm height according to the chosen top covering. 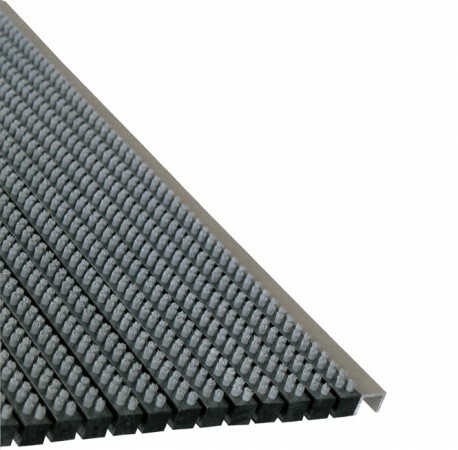 ABI Brush mat is manufactured by high resistant PVC profiles, top finished with robust 6.6 nylon brushes, it is specially suitable for heavy duty areas. Total thickness between 21 to 22 mm, 4 mm profile separation. PVC profiles are linked by high resistant steel wire and rubber separators to ensure proper stability and noise less. It strong construction enable high traffic conditions that make it ideal at civil engineering projects. It is designed to be installed inside a 15 to 20 mm high mat well. 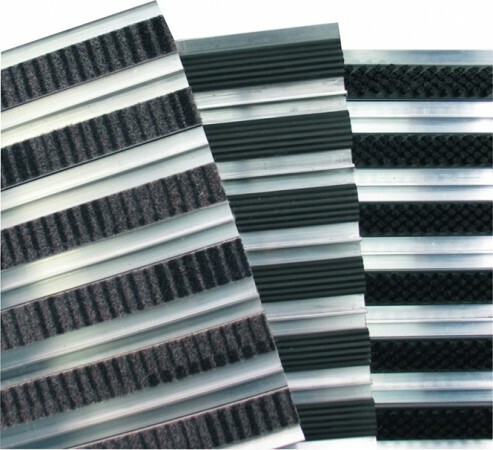 ABI Combiflex mat is a custom made mat manufactured with high quality aluminum profiles, top finished with textile polyamide fiber and single profile of 6.6 nylon brushes, this combination and it robust construction makes Combiflex mat a very reliable and lasting product, being ideal for heavy duty areas. It counts with a thickness from 20 to 25 mm depending on the chosen top covering, the distance between profiles is 4 mm and the union of the aluminium profiles in made by high resistant 2 mm ø stainless steel wire alternated with rubber pieces. Combiflex mat is recommended to be installed inside a mat well from 20 to 24 mm height depending on the top covering. Call us. Ready for high traffic conditions, airports, train stations, hospitals, commercial centers, museums, etc. ABI Duplo mat is a custom made product manufactured with high quality aluminium profiles, top finished with polyamide fibers, 6.6 nylon brushes or pro active design. Very robust and lasting product, some Duplomat models allow two working sides, so the average life is much longer. 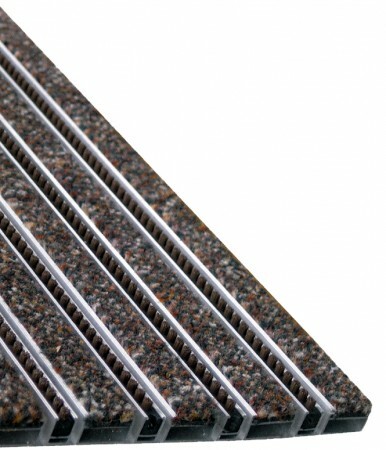 Duplomat range offer different coverings and height of 12 mm, 18 mm and 21 mm depending on the chosen termination. The union system between profiles is done by robust aluminium wires. Duplomat is ideal for high traffic locations, being an ideal solution for hotels, airports, train stations, commercial centers, theaters, etc. Recommended installation inside a mat well of 12mm, 18mm or 21 mm height. Abi Brush mat Domestic, superb entrance matting for residential use, manufactured by robust PVC profiles top finished with high quality nylon brushes. Abi Brush mat Domestic is an ideal product for residential use thanks to it modern aspect and good value for money.